Oh, Kinsmen! We must meet the common foe! No Irish, No Blacks, No Dogs! I think the subject matter might be a bit more obvious now. 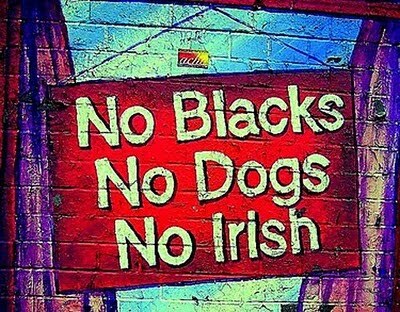 I’m not sure if many people realise this but these signs, especially the “No Irish, No Blacks, No dogs” signs happened in the UK too. I was speaking about it to some friends and they agreed that it’s only mentioned happening in the US and in South Africa with “white only”. People like Rosa parks, Martin Luther King and Malcom X are among other who are spoken about in schools. (Sometimes only shamefully spoken about in October when it is Black History month. Personally I think this history is way too important to only be spoken about a month of each year). There are lots of films out there that document and portray these events and the people. But what about Britain? Talking from my own experience, not once was it mentioned when I was at primary or secondary school, not even when it was Black History month. Can I say that it has become taboo to talk about? Well my nan must have felt that way because she never once mentioned her struggles to us (refering to the grandchildren). It’s like it has been swept under the carpet forgotten. The only thing I must mention is that they were not segregated in the UK. Back to the point, when a large amount of west indians came to Britain in 1948 on the famous”Wind rush” boat (and many after), they were greeted with signs of “Room to let, No Irish, No Blacks”. The experience my nan had when she arrived in the early 60s was that the place of accommodation was miraculously full whenever she inquired.